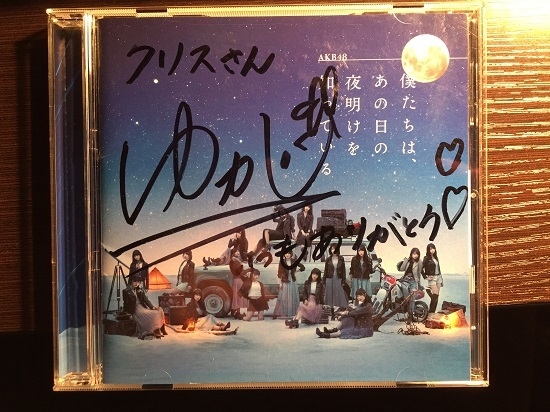 Today was the first Shamekai event for AKB’s latest album. Of course I made the mistake of getting tickets for the first event of the promotion, which is always a total clusterf**k. Many of the queues early in the day seemed to take forever to navigate. I didn’t arrive at the venue until 1:35, but it still seemed like an incredibly long day. BTW, Hiwatashi Yui was next to Zunchan, and she’s adorable! Anyway, after the shot I told her that after reading her sign at the last event, I went out and had chirashizushi. She had this semi-confused look as I told her the story, but the moment I said “chirashizushi” it all clicked for her, LOL. 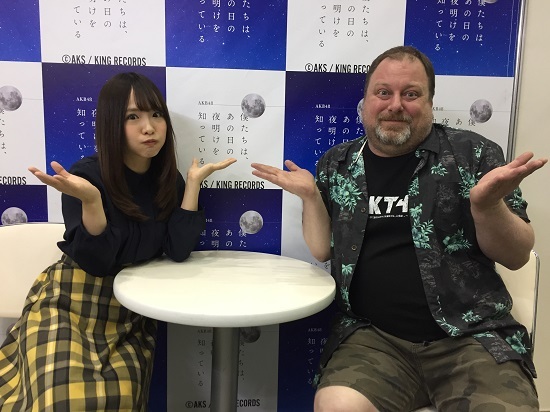 Anyway, I entertained the idea of having her sign my CD, but her Slot 4 queue was going to run so late, and the queue for her CD signing was already huge, I abandoned the mission. I really didn’t have much of a choice about it anyway, as you will soon read. 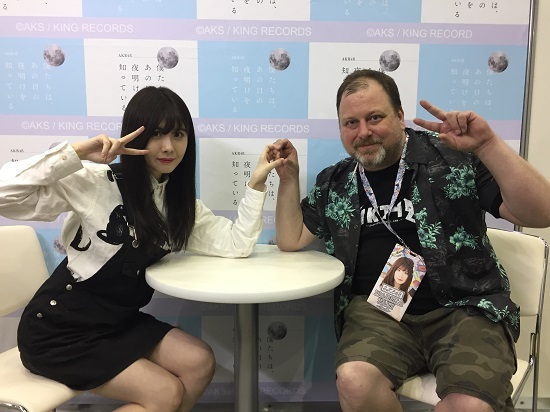 This was the one time I got a chance to talk to Yukachan for a while. I asked her how bad her foot still hurts (she said it really hurts) I told her I broke a toe a few years ago, and I know it’s really painful. 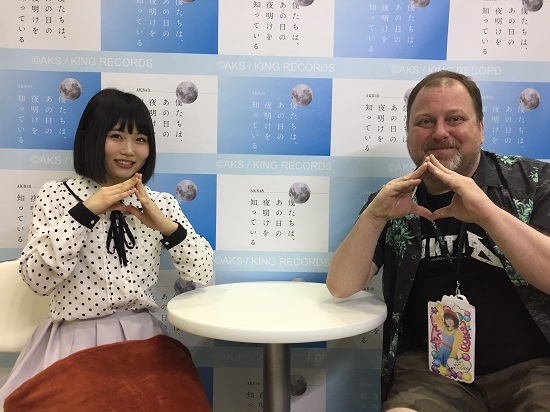 While she was signing, I turned to Mariri and congratulated her on her graduation, and then I told both she and Harutan that I am Yukachan’s English teacher, which got a laugh from Yukachan. She finished signing, and said “I really love you Chris-san!” I told her I would see her next slot. In the meantime, I had four minutes left to get to Maichan’s queue. BTW, there was a girl in line behind me for the CD signing. She was so cute! She looked a lot like Kawaei Rina. In fact I thought it was Kawaei. 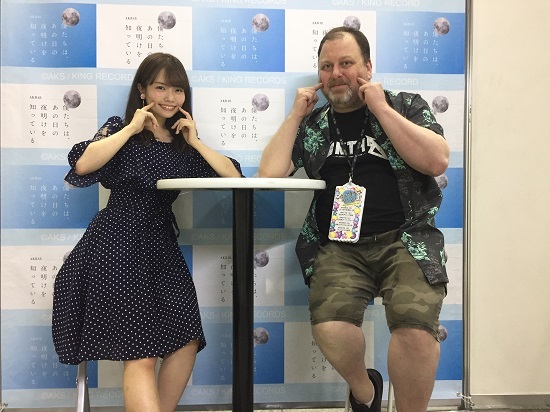 The funny thing was that she ended up behind me in Maichan’s queue too, and kinda gave me a little nod and smile when she noticed she was behind me again. Fuchigami Mai (Lane 108) I was happy that I wouldn’t have to oshimashi this ticket, since I always seem to bail on Maichan when I am pressed for time, LOL. The line wasn’t very long, and I got to the front relatively quickly. 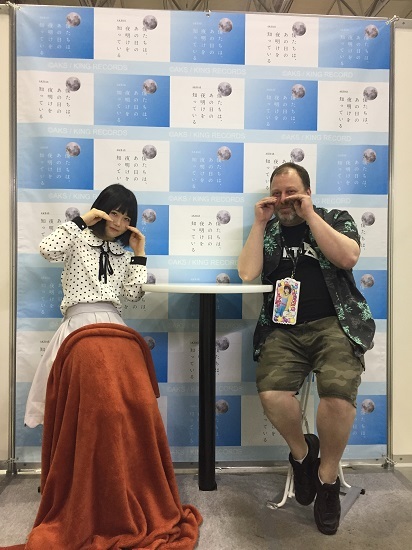 One of my favorite shamekai is from last year, when Maichan and I did this pose. So I chose it again. Maichan is so cute. I told her I went to the SSA concert and liked her solo. Oh, my poor little Yukachan. So painful. But look at her though. She worked all week, did the HKT National event on Saturday, and worked today for the shamekai event. What a trooper! I knew I wouldn’t have any issues getting my last two tickets done, but I decided to pre-queue for Yukachan again anyway. 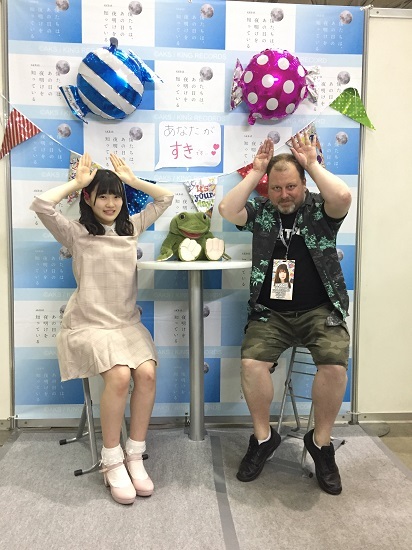 In the meantime, the Akiyoshi Birthday/Sousenkyo committee came over to me and asked if I wanted to be part of their LINE group. Of course I said yes, so they added me in. I’m not sure how good an idea this was, however, since I have been inundated with LINE messages all evening, LOL. But I am glad I am part of the team now. After the 2-shot I told her I saw her on her crutches backstage, and that I felt really bad for her. “Poor Yuka-chan” I told her to keep doing her best, and I would see her next week. Perfect! It’s my favorite shamekai of the day! A nice way to end the evening. I was finally heading home. However, I made the mistake of stopping by the station for dinner, and by the time I finished eating some concert got out and there was a mass of humanity trying to board the train back toward Tokyo. There are a few shamekai events still to go, most of them around Golden Week. However, I only have tickets to the last event in mid-May. My itinerary is slightly different. I have tickets for Zunchan, Cuca, Mio, Zukki, Kaotan, and one oshimashi (since Akiyoshi won’t be there) I have a good idea who I am going to use it on. My CD signing ticket, on the other hand, I have no idea. Those lines are the worst!